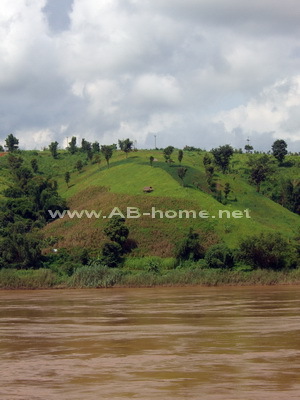 Chiang Khong is a small village direct on the Mekong River in north Thailand. Here in this cozy town is nothing special to see, just some small temples like the Wat Luang or the Wat Phra Kaew temple. The most traveler and backpacker come here for a visa run or for travel to Laos. 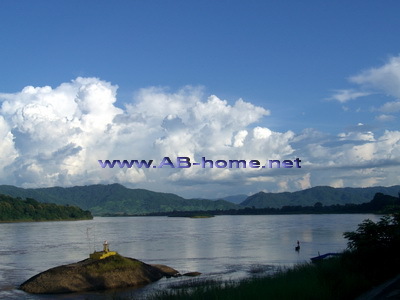 If you travel to the other side of the huge Mekong you stay already in Huay Xai which belongs to Laos PDR. Just a few people stay here longer than one night; a cheap and good hostel in Chiang Kong in Thailand is the Namkong Guest House which is just 50 meters from the river. 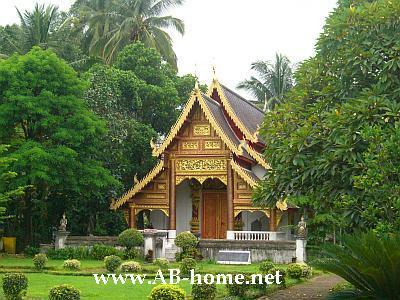 For more accommodation take a look in your lonely planet travel guide or ask in any booking office around Chiang Khong. The waterside promenade invite with many nice restaurants for a great dinner or a pleasant walk in the evening. We was leaving after one night to Pak Beng by boot, how the most traveler in Chiang Kong at the north of Thailand. Landscapes at Pak Beng on Mekong River. Pak Beng is a small city in the Udomxai province of Laos PDR. This village is on the half way from Huay Xai to Luang Prabang. 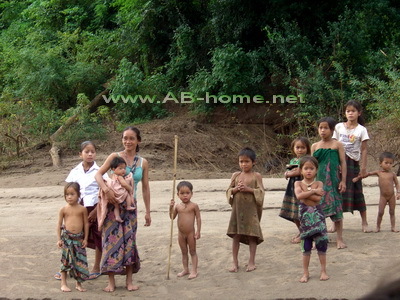 Many tourists come for one night for a break of their Mekong river tour from Thailand to LP in north Laos PDR. 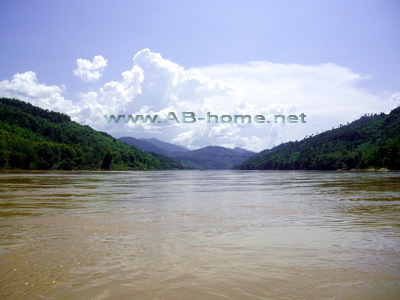 The most hotels and guest houses here in Pak Beng are on the bank of the Mekong. We slept at the Phetsokxai Hotel near the boot landing. 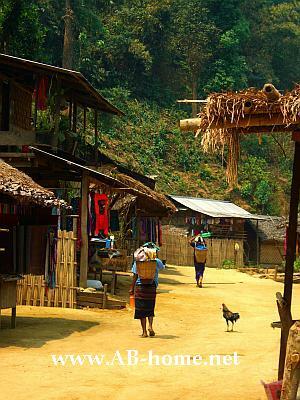 At this idyllic place in Laos you can see the traditional life of the locals. 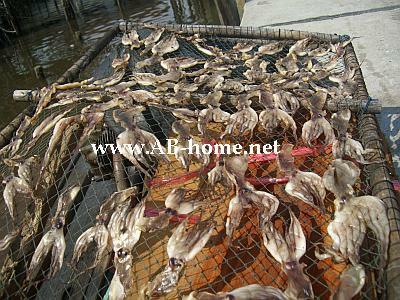 Many peoples of Pak Beng are fishermen. It’s the right travel destination in South East Asia for all backpacker who want to see some quiet places on their travel tour. 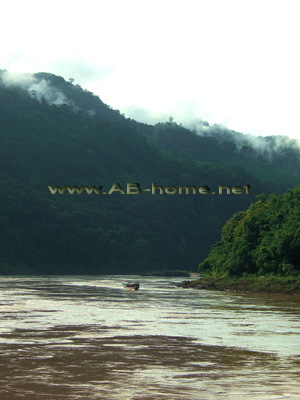 Here you can relax and feel the spirit of the Mekong River in the heart of this great country. 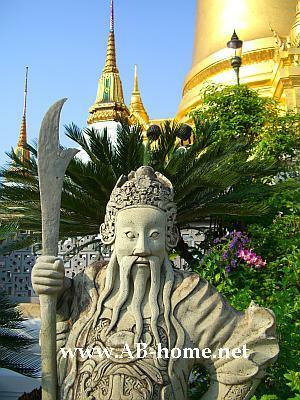 For more travel tips about PB take a look in your SE Asia travel guide. If you want to read new reports of this travel block, look here. Luang Prabang is a city direct on the Mekong River in Laos PDR. Many tourists come by boot to this UNESCO World Heritage town. 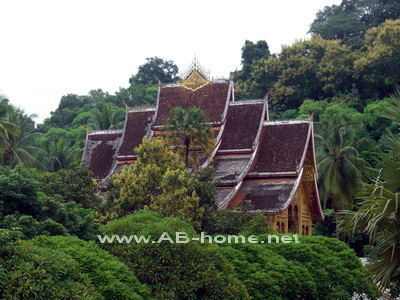 The main attractions are the old and beautiful Buddhist temples and the Royal Luang Prabang national museum. The most visited temples are Wat Xieng Thong, Wat Wisunarat (Visoun), Wat That Luang, Wat Aham, Wat Mai Suwannaphumahamand the Wat Manolom. Many tourists hike as well on the Phu Si hill to see Wat Tham Phu Si, Wat Pa Huak, Wat Pha Phutthabaht and That Chomsi from the year 1804. 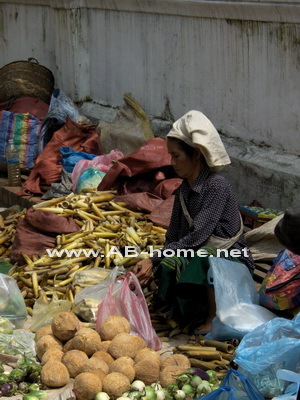 A woman sells vegetables on a market in Luang Prabang. The Royal Palace Museum of Luang Prabang in Laos shows many rare presents from many countries to the Royals and to Laos PDR and the rooms here at this beautiful Palace. In the area is as well the Royal Theatre. Four times a week tourists and traveler can watch cultural performances for 8-20 USD (2009). About 30 kilometers out of Luang Prabang town are the Tat Kuang Si waterfalls which are a visit worth! For 20000 Lao Kip you can enter in a fable world with many waterfalls and turquoise jungle pools who invite you for swimming. Many of the nice colony villas of the French in Luang Prabang in Laos are now shops for handcraft products, tourist and travel information’s, restaurants, hotels and guest houses. 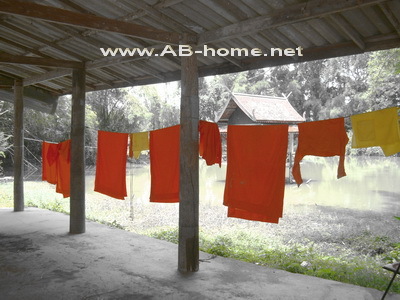 We choose the Vanechalearn Guest House on the bank of the Mekong River here in Luang Prabang in Laos. From Luang Prabang we took a flight back to Chiang Mai. From the International Airport in Luang Prabang you can fly to many destinations in Laos and Southeast Asia. Bangkok Airways, Lao Airlines and some other airlines operate the Airport in Luang Prabang in Laos PDR. Click here for more Travel Reports. 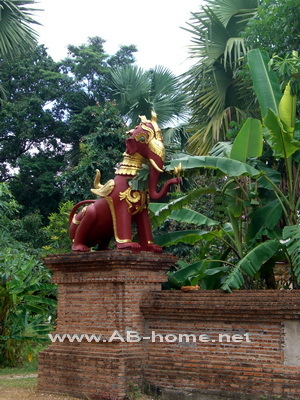 In the middle of July 2009 we went for a daytrip to the capital of the Lamphun province in north Thailand. 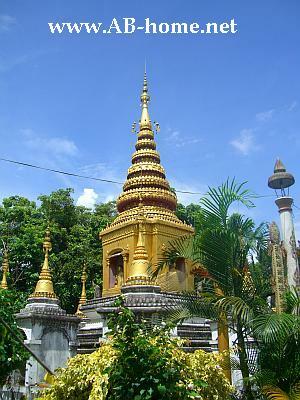 We rent a motorbike in Chiang Mai to travel to this peaceful city names Lamphun. Here living about 15000 habitats. 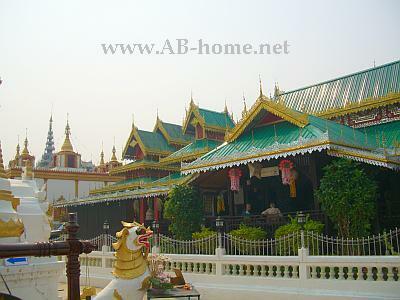 The town in the north of this beautiful Kingdom is famous for old and historical Buddhist temples. The most traveler and tourist who stay in Lamphun visit the Wat Phra That Hariphunchai and the Wat Chama Thewi Temple from the 12th century. When we arrived we had a traditional Thai breakfast in a cozy Restaurant. After breakfast we travel to the Wat Phra Yuen temple who is build in the 7th century by Queen Chamthewi, the first ruler of Hariphunchai, the former name of Lamphun, after she ruled for eight years. 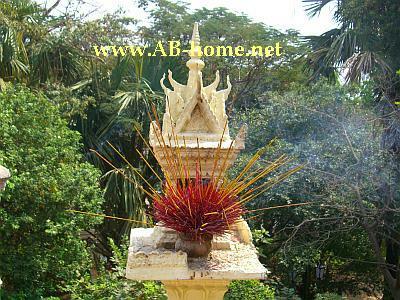 Some historians believe that King Amikaraj of Hariphunchai build this temple around 700 years before. However, this Buddhist monument in north Thailand is for me one of the highlights of Lampun. Here on this peaceful place you can find some lonely moments to relax and meditate. After we went to the Chama Thewi Temple. In the afternoon we drove back to Chiang Mai. On the way we stopped at Lotus Tesco for shopping and catch some food. The best way to come here from Chiang Mai is the bus. From Thailand’s Capital Bangkok you can take the night train which stops direct in Lamphun. 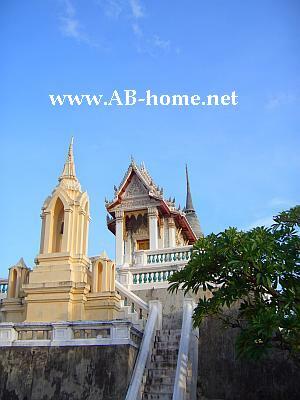 In the center of this city in Thailand you will find many options to stay. A good option is the Da Lha Resort near the center. Take a look in your travel guide or contact a TAT booking office for more information’s about Lamphun in Southeast Asia. Click here to watch new posts of Travel Reports & Pictures. 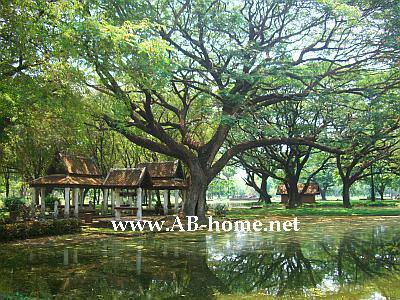 On our Travel Trip at April 2009 to North Thailand we took a stop in Sukhothai to watch the old Temple ruins at the historical park. For me it was the second time that I Travel to holy ruins in the Kingdom. 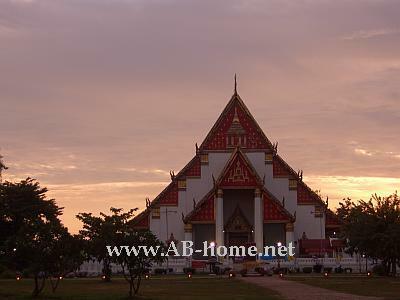 My first time was on the travel tour 2006 at Ayutthaya near Bangkok. We come here by train over Phitsanulok and stayed at the “Old City” Guest House in old Sukhothai. We took a Motorbike at “The Coffee Cup” Restaurant to explore the holy City. Our first stop was the Wat Phra Luang where we watch a huge Buddha statue and the three towers of the Temple wich are build in Khmer stil same the Temples of Angkor in Siem Reap. This holy building was build in the 12th century. From ther we drive to Wat Si Chum where is a 15 meter high sitting Buddha. Than we took a brake and drank some refreshments at a Thai Restaurant on the Main road. After we relax on a lake near the Wat Sa Si. From there we drove back at long Sukhothais biggest temple Wat Mahathat from the 13th century. The last sights for our day in Thailand‘s first Capital was the Wat Trapang Thong, Wat Mai and the National Museum. Back at the old city guest House we took a shower and slept for a while. Than we went to Central Market to catch some delicious Thai dishes. We went early to bed because our Bus to Pai was leaving in the next Morning. 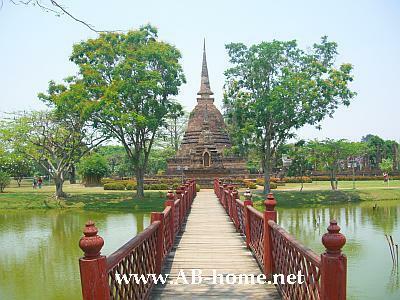 The old City of Sukhothai is a nice travel destination for all Backpackers who travel in Asia. The most temples here in Central Thailand are rebuild and in a good condition. For more travel tips ask at a TAT or buy a travel book for Southeast Asia. 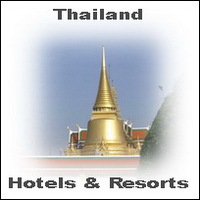 Click here for Mae Hong Son Hotels and accommodation deals. At the beginning of April 2009 my wife and I was traveling by Motor scooter from Pai to Mae Hong Son in north Thailand. We started at 6:00 am because the trip to the province capital need about three hours and we wanted being back before the Sun leaves behind the Mountains. On the way are many Scenic Areas which offer a great panoramic view over the Asian Highlands. We arrived at about 9:15 at central Mae Hong Son. Our first destination was the Crossroads Restaurant where we did a stop for good breakfast and a delicious fruit shake. After we went to Jong Kum Lake to watch the Wat Jong Kum and the Jong Klang Temple. On the way out of town we stopped at Wat Pha Ang to make some pictures of the beautiful Buddhist Temple. The Temples look a bit different than in other regions like Bangkok in Central Thailand. 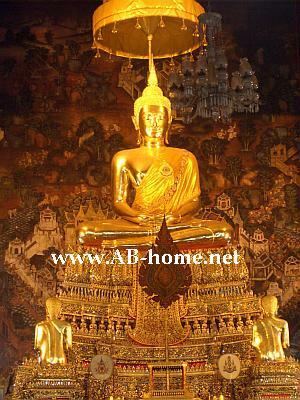 The Province Capital have many other Temples which you can visit: Wat Hua Wiang, Wat Muay Tor, Wat Phra That Doi Kong on a hill and Wat Phra Non where you can watch a Reclining Buddha Statue. If you want to stay at this Asian City you will find a Guest House or Hotel around the Jong Kum Lake, or read the Lonely Planet Guide. On the way back we was traveling to a Longneck Karen village named Ban Nai Soi which is 15 km out of the city. This was the highlight on this day for me. Before we went back, we drive to the Tham Pla Fish Cave which is on the way from Mae Hongson to Pai. The landscapes here in this Southeast Asian Mountains are amazing, take a look in your Travel Guide and don’t miss this beautiful destination in Thailand. The minority village Ban Nai Soi is about 15 km out of the state capital of Thailand’s Mae Hong Son province in the north. It’s easy to reach by Motorbike. Just follow the signs to the Longneck Karen Village. 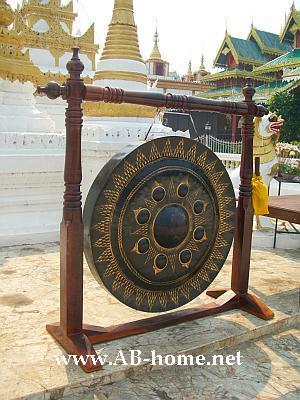 In the 18th century the Burmese-tibeto origin come to the north of the Kingdom. The woman’s of this “type” of Karen minorities wear metal rings around her neck’s which let them look as a longer neck than other people. Nobody knows really why they do that, but they wear it since generations. Some people believe that they wearing the rings to protect them self from tiger bites. 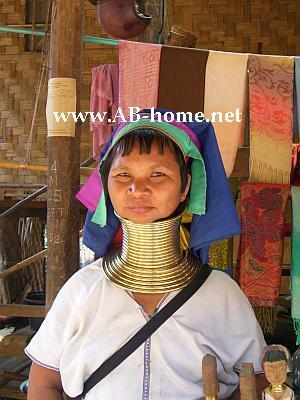 Other ones think the Longneck woman in Thailand’s Mountain wear the metal because than they are not attractive for men from other hill tribe minorities. Some travelers or backpacker don’t visit the Karen villages in North Thailand because they think that they destroy the culture. I think it’s ok to visit them when you follow some rules. For me it’s important to know something about the people and the art of living before I visit the village. Just in this way it’s possible to respect the lifestyle and the culture of the Karen. Inform yourself is it ok for them that tourists come into the Thai villages in Asia. Some Minorities don’t like that the travelers make pictures because of religious aspects. Don’t touch statues or sth. like that, maybe it’s holy for the hill tribes. My point of view is: if you know something’s about their life, you can respect that and if you want to visit the Longneck Karen its ok so long you leave nothing instead of used air and footsteps at the village. No waste and no inspirations for a different life so far it is possible. For us it was the second time that we visit Karen Minorities in North Thailand but the first time that we meet the Longneck woman. Our first time was at Chiang Mai’s Doi Internon National park. We traveled by motorbike from Pai to Ban Nai Soi village near Mae Hong Son town. It was a nice trip at long the beautiful landscapes of the highlands in Asia. The village is about 500 meter long and on every side of the path are simple bamboo huts where the Karen lives. One Longneck Girl give me a neck ring, I think it was about five kilogram heavy. I read before the metal on their body’s can be up to 25 kg. The people are friendly and it’s nice to see how happy people can be without commercial thinks far away from shopping malls and other civilization thinks here on this quiet spot in South East Asia. The waterfestival in Thailand is the new year of the Moon calender. The locals celebrate Sonkran on the 13th, 14th and 15th of April every year. Traditional the thais drop some good smell liquit over holy Buddha and King statues at temples and at home. Young Monks “bath” the hands of the older ones to show respect. At this three days in nearly every city in Thailand is a big water festial. If you want to be dry, better you stay at or hotel or guesthouse. The better way is: let your camara, mobile, passport and all important thinks at home and celebrate toghether with the Thai locals the Sonkran Festival. It will be a lot of fun! This year was my 3th Songkran in Thailand. In 2006 I went to Patong Beach on Koh Phuket where the tourists bargirls and backpackers did a big water spectacle till late at night. 2007 I was on Koh Chang at Thale Bungalows, there it was much more relaxter. This year I have bin with my Girlfriend in Pai in Thailands Mae Hong Son Province. All three days we spent at Stone Free Bungalows. Here in the north the hole village will entertain you till you completly wet.The biggest Songkran celebrations are Chiang Mai and Bangkok. This South East Asian Festival is a good possibility to learn something about Thai Culture. If you stay in the middle of April in Thailand, try it out! Buy a Watergun or a bucked and mix yourself under the locals to celebrate the Waterfestival. Here are some beautiful Pictures of Buddhist Temples in Southeast Asia. 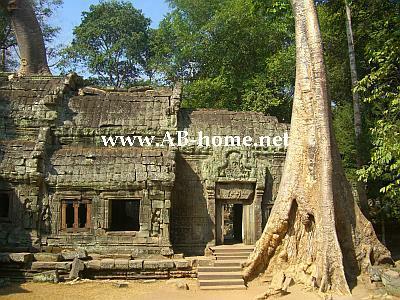 I did this Photos on my Travel Tours through Cambodia and Thailand with my Casio Exilim Digital Camera. Click here for more Picture Serials. 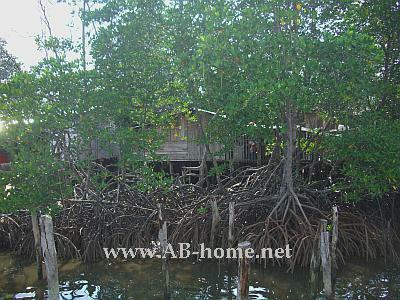 In March 2009 Moun, some friends and I traveled to Mairood Fisherman’s Village in Thailand‘s Trat Province. After a Visarun to the Asia Had Lek boarder between Thailand and Cambodia we visit some friends who work here in this traditional Thai village. 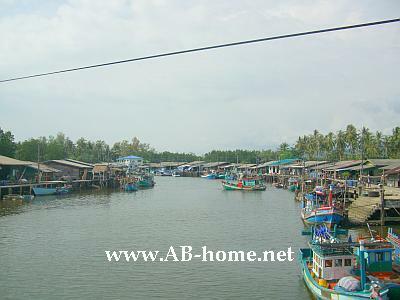 The sleepy village is direct over a River who runs into the Gulf of Thailand. Nearly everybody lives here in Mairoot from the fishing. A good Choice for Tourists and Backpacker is the Mairood Resort which is direct in the center of the piervillage next to Klong Yai Town. 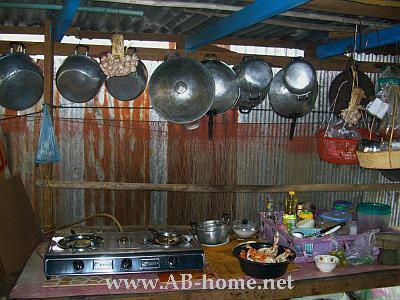 Here are not that much possibilities to stay (Guest Houses, Hotels…) because the tourism is really low here in Mairoot. We traveled by Minibus from Had Lek to the small fisherman village and our friend picked us up to his traditional Thai house where he lives with his Mother and his Girlfriend. We bring our bags to the cosy home and walked to a small Thai Restaurant and eat traditional Thai Noodle Soup with Chicken. After we visit Nop’s sister and eat some sun dried and fried squit on a terrace over the river. After we go back to Nop’s and Jing’s home. We bought some Chang & Leo Beers in a small supermarket on the pier and cooked a very delicious Sea Food BBQ with shrimp’s, fish, shells and crab’s. On the next morning we woke up early because the Fisher boats drove next to our room. A nice feeling to wake up over a river in a House over the water. We walked at long the big pier to a taxi which brought us back to Trat the State Capital of Thailand’s Province in the south east. In Trad Town which is about sixty kilometers from Mairoot we had Breakfast at the day Central Market. Than we took a Mini Van to the pier where the Ferry to Koh Chang leaves. At 9 o’clock we arrived at Big Elk Bungalows on the Klong Prao Beach. We took a shower and changed clothes before we went to the Kheeri Phet Waterfall on Ko Chang in Thailand. It was a realy nice Travel Trip to Mairood in Thailand. The local Thai people are really friendly and helpful. The tourism is nearly zero, just some Backpackers and Tourists who like quiet holiday getting lost here on vacations at the Mairood Resort. It’s nice to see the all day life of the Thai Fisherman’s here in this cosy village in South East Asia. I can recommend Mairood as a Travel Destination for Backpackers who like to see a traditional village in Thailand direct on the Beach. For Accomendation, Informations and Maps of Mairood look in your Travel guide or contact a TAT office in Trat.